Retweet, Reblog, Repost, Reshare! Get the word out! 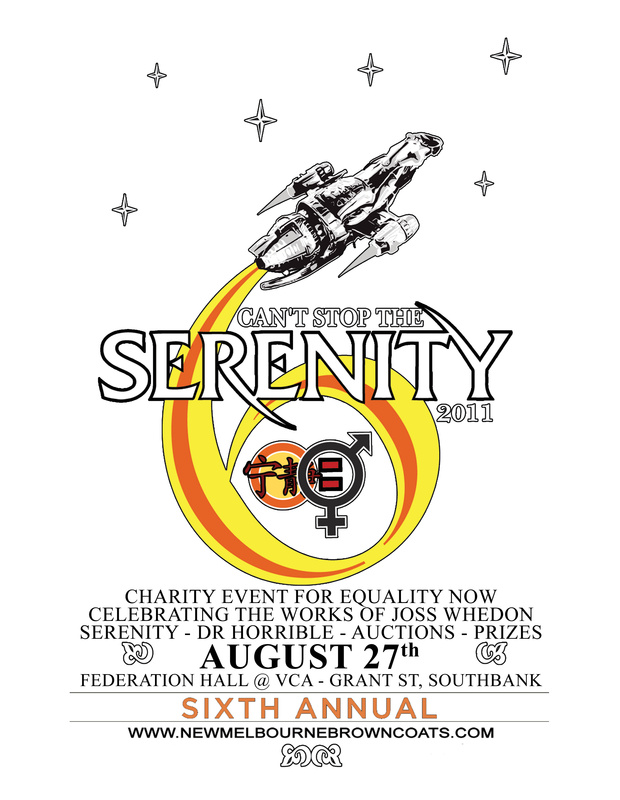 “CAN’T STOP THE SERENITY ” is an annual, global, charity fundraiser organised by fans of Joss Whedon’s acclaimed sci-fi/drama series “Firefly” and the movie that followed, “Serenity”. Firefly fans – affectionately known as Browncoats – have held the annual event for the past five years. Melbourne Browncoats have proudly taken part since the very beginning in 2006. Our local events have contributed to the raising of over US$500,000 for charity, Equality Now. The screenings are entertaining, theater-packing events where plenty of new friends are made. In many cases, the excitement of again seeing the “Big Damn Movie” on the silver screen can be more exhilarating than when the movie first opened in 2005. Each year brings new faces; people who are seeing the film for the first time and get fired up about the cause. Between the fun atmosphere and the community spirit showed by raising funds for Equality Now, it’s easy to see why these events keep getting bigger each year. 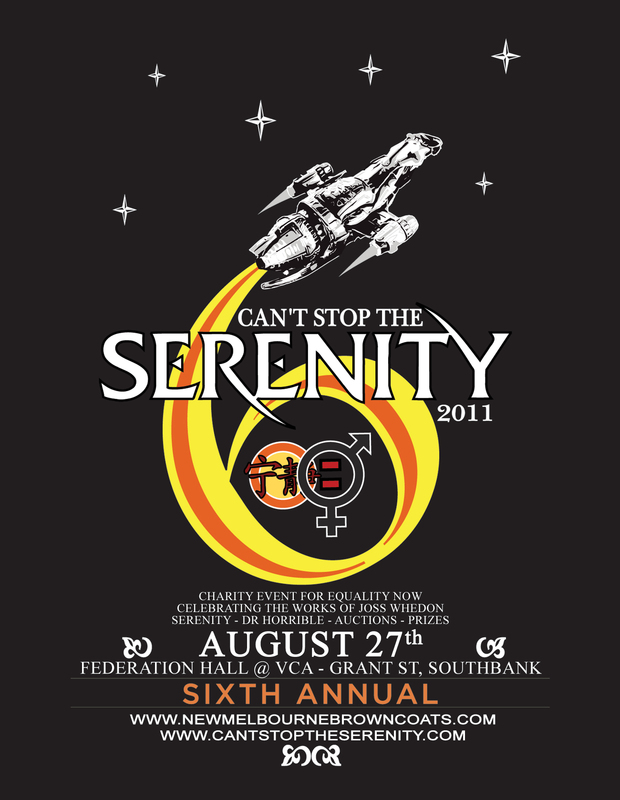 This year, as a newly incorporated non-profit organisation, the New Melbourne Browncoats are proud to announce that on Saturday, August 27, we will be hosting our 6th annual Can’t Stop the Serenity event – featuring screenings of “Serenity” and “Dr. Horrible’s Sing-along Blog” – at Federation Hall, Grant Street, Southbank from 4pm. This year’s event will also feature raffles & door prizes, a charity auction, and a fantastic selection of Browncoat merchandise. Tickets are now on sale at http://bit.ly/csts2011 for $18 (including booking fee) or for $20 on the day. Can’t Stop The Serenity supports Equality Now in their work to end violence and discrimination against women and young girls. Firefly is a science fiction television series that premiered in the United States and Canada in 2002. The series was developed by Joss Whedon, who also created the cult favorite Buffy the Vampire Slayer. The series concept merged the classic Western genre with a science fiction backdrop, applying naturalistic science fiction concepts such as showcasing flawed characters in humble circumstances. The short-lived series was cancelled after only eleven episodes were broadcast, however, strong sales of the DVD collection of all fourteen produced episodes allowed Whedon to convince Universal Studios to produce a film based on the series, titled Serenity, which was released globally in 2005. In Australia, the series and film have screened a number of times on Channel Seven, Fox8 and the Sci-Fi Channel. This 2008 Emmy-nominated musical film was produced exclusively for online distribution, and became a web sensation. It tells the story of Dr. Horrible, an aspiring super villain (Neil Patrick Harris – How I Met Your Mother); his nemesis Captain Hammer (Nathan Fillion – Firefly, Serenity, Castle), and Penny, their mutual love interest (Felicia Day – The Guild, Buffy the Vampire Slayer, Dollhouse). Written by writer/director Joss Whedon, Zack Whedon, Jed Whedon and Maurissa Tancharoen, and now available on DVD, it is both hilariously funny and moving, with incredibly catchy and well-written songs.